If you have heard anything about dishwashers in the last decade, chances are you’ve heard about both GE and Whirlpool. These two major appliance brands have been dependable institutions for years now. But if you’re looking for a new dishwasher, you might be asking yourself just which company will serve you best. And while both GE and Whirlpool have a reputation for producing quality, dependable dishwashers, they definitely have some distinctive characteristics. When it comes to dishwashers, there are a lot of factors to consider. The first thing you’ll notice is the design, and this has an effect on both visual appeal and ease of use. You might like the sleekness of a hidden-panel design, but appreciate the convenience of a model with the controls on the front. Interior design matters, too. The placement and arrangement of racks can make your life easier or harder. Meanwhile, there are other important factors to consider like unique cycles and wash types, energy efficiency, the quietness of operation, and other major considerations. In this article, we’ll take an in-depth look at some of the most important features of both GE and Whirlpool dishwashers, and help you decide which brand and product will serve your needs best. Considering the central location of the dishwasher in your kitchen and living space, how loud it operates is an important factor. You don’t want to be unable to hear dinner conversations over the noise of your appliance. Both GE and Whirlpool offer dishwashers with impressively quiet noise ratings. Price points, however, go up the quieter the dishwashers become. For example, GE dishwashers under $500 have a 54 dBA to 64 dBA noise range. In the same price range, Whirlpool has also almost the same noise level between 55 dBA to 63 dBA. Between $500 to $749, GE offers 48 dBA to 62 dBA noise level while Whirlpool boasts 47 dBA to 57 dBA. Between $750 to $1099 (which is the upper limit for Whirlpool) GE has 45 dBA to 64 dBA noise level. You might be concerned about 64 dBA, but this is an under-sink model dishwasher, not a built-in one. Whirlpool has 47 dBA to 64 dBA (again, this is a portable dishwasher). Above $1099, there are only GE Profile and GE Cafe dishwashers and their super silent noise levels range between 40 dBA to 45 dBA. One of the most impressive things about both GE and Whirlpool is the range of design options they offer. Both brands boast front-control machines with visible electronic controls and sleek and hidden-control style dishwashers. Both brands also offer dishwasher models with customizable panels that blend well with surrounding cabinetery. However, we believe both GE and Whirlpool maintain an unnecessarily large catalog (GE with some 100 dishwashers, Whirlpool with 50 models) littered with old-fashioned looks and super loud dishwashers. In this review, we are going to ignore these dinosaur models in the interest of keeping up with modern times. GE’s Café series offers a striking design that features a professional kitchen-style handlebar and stainless steel look. Though the overall design is a bit bulky, it does give a professional impression that many users love. GE also boasts a rich range of color schemes, from standard black and white to stainless black, slate and black slate options. This means you have a great deal of flexibility in choosing the right finish for your kitchen design. Whirlpool also offers impressive visual designs. But what is a dishwasher without the power to effectively wash and dry your dishes? One of the best things about both GE and Whirlpool is just how many distinct cycles and washing settings their dishwashers offer. Both brands cover all types of the “must have” cycles, including light, normal and heavy cycles for different levels of soiling. Both brands also offer an automatic washing cycle that determines wash time based on the soil level detected by built-in soil sensors. Sanitization and high-temperature washing are also common in both brands. However, higher-priced GE models boast additional washing cycles that Whirlpool can’t match. These include Express washes for a quick clean on lighter soiled dishes. eWash is also designed to use less energy, and options like this are available in the GE Café CDT865SSJSS model, among others. Cleaning silverware effectively can be challenging, so GE has created silverware jets that are dedicated to this critical task. They ensure that your silverware is cleaned properly every time. Deep Clean Silverware Jets are even added beneath the silverware baskets in select high-end models. In terms of rack space, both brands offer a 3rd rack option in some models. This is a great place for placing extra silverware or thin dishes. Both brands also make this rack removable when not in use, allowing for higher stacking on the second rack. Both brands also offer WiFi options on more expensive models, plus compatibility with Google Home and Amazone Alexa. This means you can control your dishwasher by your voice, or adjust settings and start cycles while away from home. You can even check error status and monitor the cycle. Whirlpool technology offers Control Lock Mode, which disables the control panel and keeps children or unaware adults from accidentally canceling or starting a cycle. GE also matches many of these features in their own products. Besides the classic two-blade washing arm design, both GE and Whirlpool offer upgraded washing arm technology. Whirlpool uses the TotalCoverage Spray Arm, featuring 21 nozzles instead of the standard 10. The nozzles turn on and off during the washing cycle to reach more areas than a regular washing arm and clean more efficiently. However, GE has Whirlpool beat in this department as well. Their QuadBlade washing arms are absolutely fantastic, using four unique blades with even more nozzles—as many as 25 in the higher-end versions, with unique angles and the ability to turn both clockwise and counterclockwise. GE also offers Variable Pressure Water Jets, applying different intensity levels to different dishes—GE understands that different types and levels of soiling require different water pressure levels. It should come as no surprise that GE offers a flood protection system to detect leakage from the bottom of the machine. Whirlpool offers no such feature. It should be clear at this point that GE and Whirlpool make machines that get the job done. But for how long? Are their devices built to last? The short answer is yes. Both Whirlpool and GE machines are manufactured in the US to the highest standards of quality and durability. Whirlpool earns the slight edge here, with their machines reporting fewer repair needs or issues. Plus, their repair costs are lower than just about any other brand on the market. GE Appliances are not far behind, but the bar is set high and they have a way to go before reaching the pinnacle of durable and dependable operation. 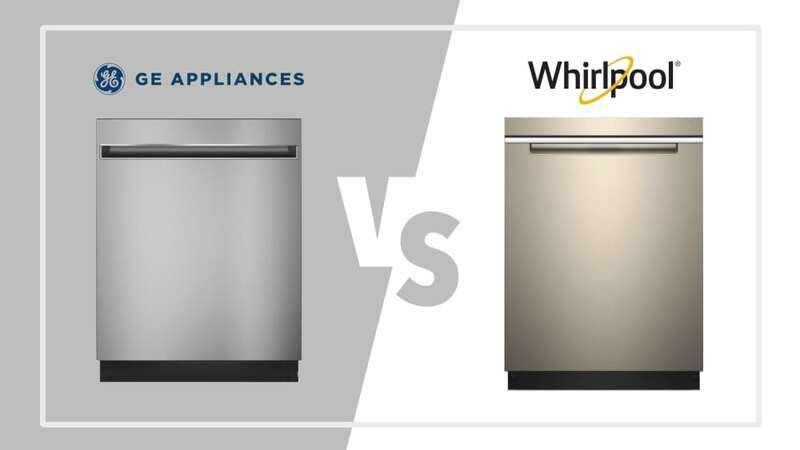 Now that we’ve taken a look at the features of Whirlpool and GE machines, let’s talk about their pricing. To compare the pricing models and value of these two brands, we’ll take a look at some of their most popular options in different price ranges. Here we’ll compare three pairs of machines, one from GE and one from Whirlpool for each pair. We’ll see how their feature sets and price points compare. First, let’s begin with the budget options. Extremely popular with users, the WDT730PAHV is Whirlpool’s budget option. It features a hidden control design and clean, modern look. The wide handlebar is perfectly placed to keep from disturbing the sleekness of the machine. The plastic tub isn’t quite as effective for drying as stainless steel but helps this dishwasher maintain its budget-friendly price. With slight variations in price, you can choose a fingerprint resistant stainless steel or black stainless steel model in addition to black or white. At 51 dBA, it’s not an ultra-quiet machine. But it certainly won’t have you covering your ears. With 5 washing cycles, you’ll have a good variety of options for everyday use. The one-hour wash is a great choice for washing dishes with lighter levels of soiling. You’ll also enjoy access to Sensor, Heavy, Normal, and Soak & Clean wash cycles for increased flexibility. Featuring a front control design in a classic profile, GE uses electronic buttons to ensure a modern look. Unlike the Whirlpool model, there’s no front handle. While this means one less towel hanger in your kitchen, it does provide a more streamlined look. This model also uses a plastic interior tub for cost considerations, as well as a height adjustable upper rack that’s fully removable to allow space for bigger pans on the lower rack. At 51 dBA, it’s moderately quiet. It’s also available in black, white, slate and stainless steel. The GDF 610 features bottle jets on the upper rack for cleaning tall glasses and bottles, and like the Whirlpool counterpart, it features a high-temperature wash and heated dry options. Its normal cycle is 73 minutes long, making it one of the shortest normal cycles out of any dishwasher. You’ll also enjoy a Sanitize option, plus Auto Sense, Light, Normal, and Heavy wash options. Available at a mid-level price but with many of the features that make Whirlpool great, this is a great model to consider. It features a hidden control dishwasher with a sleek design and brightly finished handlebar. It uses a stainless steel tub, which makes it durable and quiet during operation at only 47 dBA. It features a 3rd rack, plus folding tines and multiple color options. These include white, black, fingerprint resistant sunset bronze, fingerprint resistant stainless steel, and fingerprint resistant black stainless steel. In addition to standard washing cycles, this model features additional options including a Plastic Items Cycle and Canning & Brewing Items Cycle. It also features the TotalCoverage Spray Arm and integrated WiFi capabilities. Also a hidden-control dishwasher with a stainless steel tub, its 45 dBA noise level is quieter than its Whirlpool competitor. It features only two racks, made from nylon for getting the job done. The multi-position tines allow the user to customize their interior washing space, while the three color options are black, white and stainless steel. When it comes to features, the GE Profile PDT825 is the clear winner. It features more than 140 spray jets, plus Deep Clean Silverware Jets, a 4-Pass Multi-Wattage Wash and Dry element, Fan Assist Dry, Heated Dry, Floor Protect, and Steam Prewash. That being said, it doesn’t feature a Wi-Fi option. Because Whirlpool doesn’t offer any products in this range, we’ll only specifically highlight a GE model. This panel-ready dishwasher has all of the high-level GE Dishwashing features, including a customizable front panel, stainless steel tub, super-silent 40 dBA noise level (quiet as a library! ), and a three-rack interior design. The heat-adjustable upper rack features bottle jets while the lower rack features multi-position fold-down tines. You’ll also enjoy WiFi connectivity, plus additional washing cycles including Express, eWash, and Rinse. If you’re looking for the best of the best, you can’t go wrong with the GE Profile PDT855. Overall, you’d be hard pressed to find major issues with either GE or Whirlpool dishwashers. Whichever brand you choose is likely to leave you satisfied with your purchase for years to come. While GE holds the slight overall edge, both manufacturers offer high-quality machines that are rich with features to make dishwashing easier, more effective, and more enjoyable.